It’s human nature to want to be that perfect family. I know we all strive for that but we are perfectly flawed too. In adoption we strive even more so as we try to express who we are in a few short pages. Maybe we have an online presence to show more about us but you never know if the expecting parents will see it. So in the grand scheme we describe ourselves through pictures and words in a brochure format sent to expecting parents to look at. They get to see the great people you are but not the flaws of being a human being. We all have them and I thought I’d share ours and how we have adjusted to each other’s and make it work to our benefit. Don and I are yin and yang. He’s order and I’m chaos so to speak. I’m perfectly fine with things just wherever I put them down and he is put it where it belongs the first time. We have over the years together learned to live in ordered chaos. I know that he came to appreciate that I can’t find things if he moves them and same for me. We have totally different desks outside that they both have computers. Mine with books, mail, toys, and my trail mix and his is just his computer. This doesn't mean we live in a dirty house by any means so please don’t think we do (we wouldn't pass our home study if we did!). I clean and he cleans but I’m not picky if the mail sits on my desk instead of going through the shredder right this second or being filed. Dog toys litter the house and while I don’t care because they just drag them all back out the second I put them away (unless I’m vacuuming and then they aren't around), Don has to try putting them back in the toy box. I always chuckle because the second he puts them back Parker and Tucker are digging out their favorite toys leaving a trail of other toys behind. I think having pets and a wife who can live in chaos has helped him see that we all have our ways of keeping our stuff as we need to. It has also helped me to see the order side of him. Everything in its place means he has what he needs when he needs it without having to ask me or getting frustrated that he can’t find it. We found the perfect balance and know our child will benefit from both perspectives. They will have a mom who won’t mind the toys everywhere and a dad to reinforce putting your stuff away when you’re done playing with it. Both are valuable lessons. I know when my nephew visits I’m usually the one who says put your things away more than Don but I know if I didn't he would and knowing we will be on the same page with our child is a great beginning to build on. 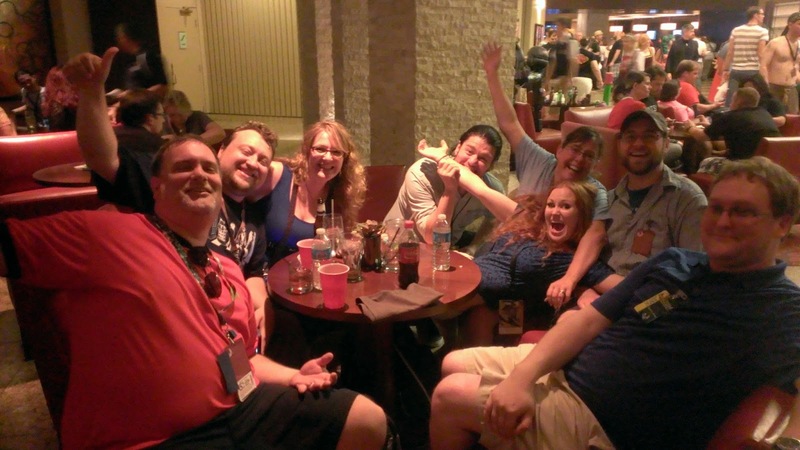 What exactly is Dragon Con and why do you go? 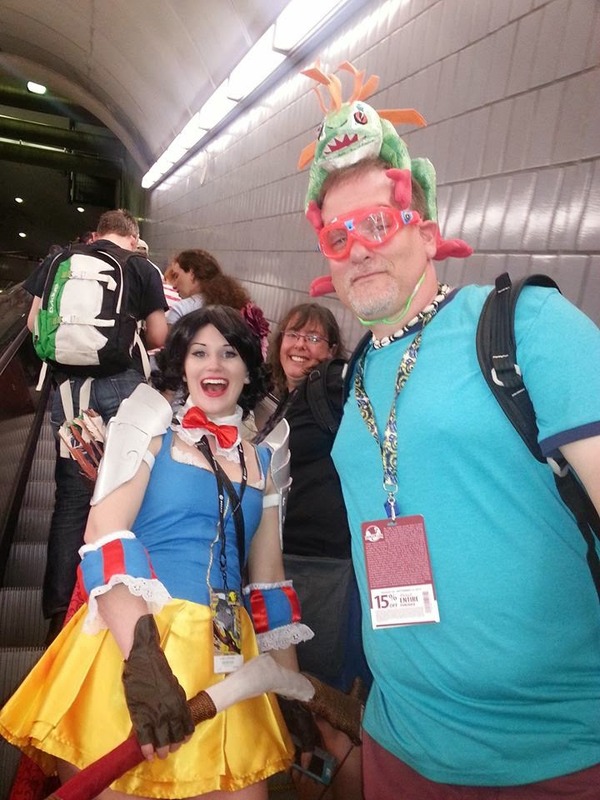 As stated by the official website Dragon Con is “We are the largest multi-media, popular culture convention focusing on science fiction & fantasy, gaming, comics, literature, art, music, and film in the universe.” To us it’s so much more. Yes, it is those things but also history, technology, science, engineering and the most important factor is Friends! We have friends all over the country and a good portion of them live in the south. 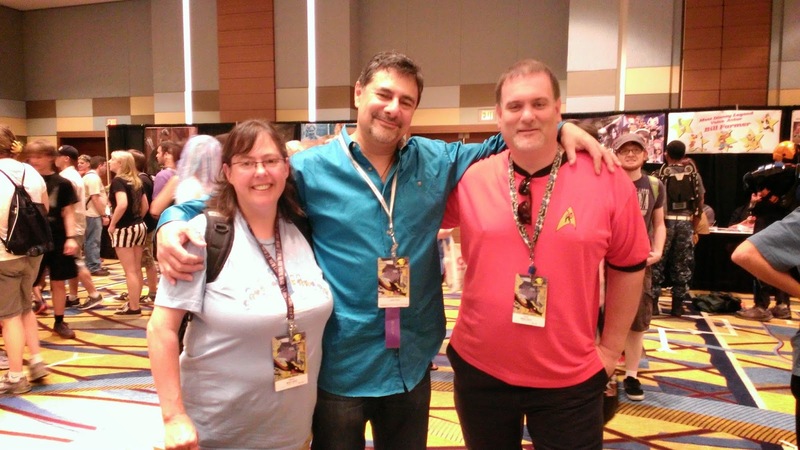 So every year we get together in Atlanta for Dragon Con if they can make it, even for a day (Don and I are there at least 4 days, having flown cross-country). Our friends drive in from Atlanta, Tennessee, and Alabama. We have a friend in Florida but they've never been able to make it. 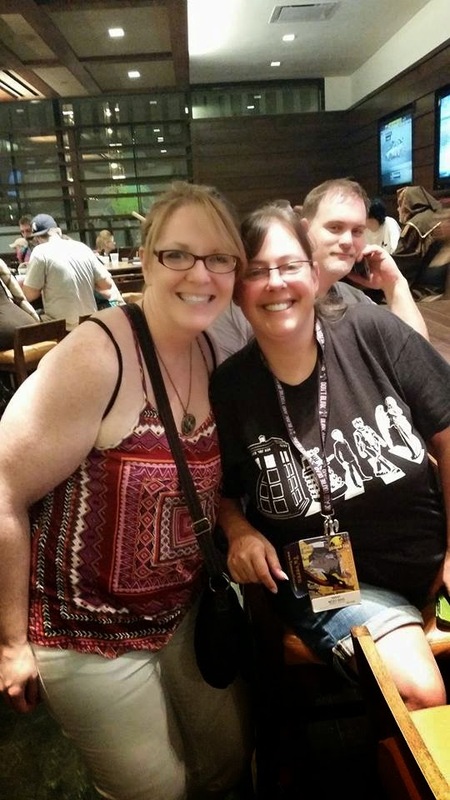 Dragon Con spans 6 hotels over downtown Atlanta and so the events are usually grouped into one hotel for the duration such as Doctor Who panels in the Hyatt or Star Trek related panels, contests, etc in the Weston. They also feature shopping for everything imagined and then some in the Americas Mart. I really can’t wait to share Dragon con with our child and have them know all our friends. 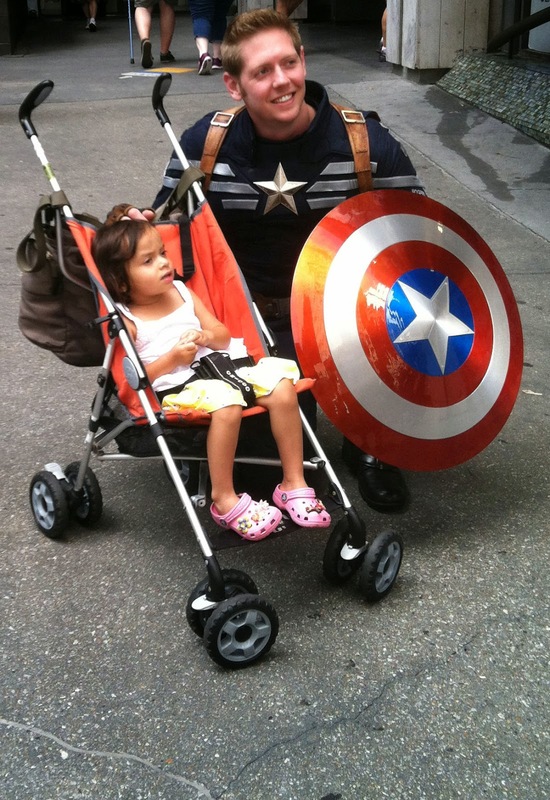 So cute posing with Captain America while her dad took pictures - Hoping that is us soon! 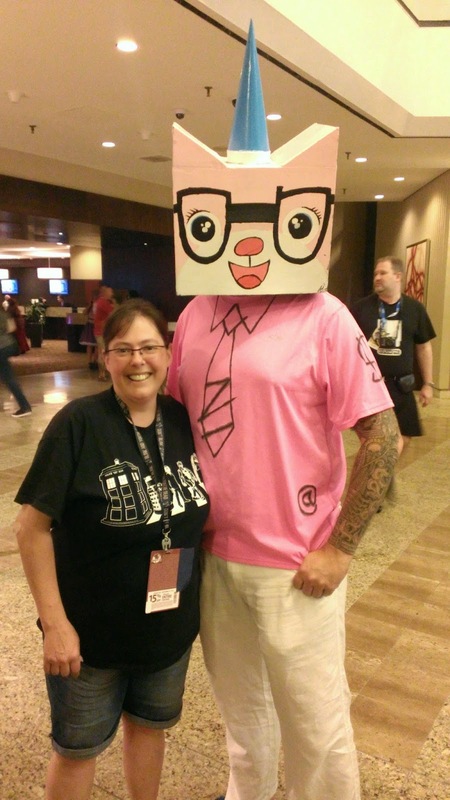 We absolutely love Dragon Con. In fact our friends from Alabama were the first to tell us about it and upon finding out we had to plan to go the following year. WOW so much to do, we didn't make many panels that first year but we had fun shopping and watching the Cos-players and meeting up with our friends on Saturday. That first year was simply amazing for us as the one panel we did make (Farscape) led us to the autograph room where we had a great conversation with Gigi Edgley (wish we'd gotten pictures that first year instead of just autographs) and some of the cast who were on the panel. What I like is the stars aren't usually pretentious and will have normal conversations about their work; granted the super-stars are pretty hard to get to due to the one hour of signatures and done so good luck!, better wake up at 6 and get in line by 7 for a 2 o’clock autograph session. I wanted Patrick Stewart last year and the line was around 3 blocks long (think New York city blocks) for a one hour session, um ya OK, off to do something else and I will have to live without meeting him. Last year we were thrilled to meet and talk with a few actors we really wanted to chat with and they were amazing and so are their upcoming projects (or past ones in some cases). It sounds like we spend a lot of time fanning over the actors but actually we hit the autograph room once, usually Saturday unless someone we want to see is only available on Friday. We try to figure out the best time to go and hit the room and hope everyone we want to talk with is there, sometimes we aren't that lucky. The other must Hall to visit is the Art Hall where we usually meet up and chat with a friend of Don’s who sells her work during Dragon Con. So many different artists and kinds of art work from paintings to sculptures to metal work. The art hall is also where you’ll find the comics. What else is great about Dragon con is the cos-play. One of my best friends (Lara Cupcake) is a cos-player and although considered amateur we think she does a fantastic job on her costumes from the design to re-imagining some of the characters. She been actively doing cos-play for cons’ for about a year and a half. Last year when we all went together and shared a room she had 4 costumes and the amount of work she puts into not just making those costumes but actually dressing in them for the day is phenomenal! Really cos-players do so much for fan support as they enjoy bringing a favorite character to life for everyone to enjoy seeing as they go from panels to contests and photo shoots or just walk about the streets in downtown. I don’t usually dress in anything except shorts and some tee from a show (Like Doctor Who, Firefly or Nightmare before Christmas). Next year that changes as I found a really fun steam punk inspired dress that I’ll be wearing on Saturday, as for the rest of the time I’m unsure if what I’d like to do with our friends as a group will work out. One thing to consider is just what you are cos-playing, Don did a Murloc one day last year and was super hoarse after making the sound all day/night. That was one thing we all talked about as for our costumes this year was what we needed to be comfortable because it is Atlanta at the end of summer. Saturday night is the night we all gather together and people watch. We have a blast as the cos-players come and go. It’s the night we take the most pictures of us with cos-players or each other being silly. A lot of times we all want to do different panels, signings, etc during the day so it’s our chance to just set aside time to all compare notes on the con events or things we've bought or saw. yep, Don photo bombed us - LOL. Last year we were all staying out at an airport hotel but this year we actually managed to get hotel rooms downtown so that’s going to be a huge bonus over taking MARTA back to the airport, then a shuttle to the hotel, and having to carry all our stuff around all day. That makes us actually more into dressing up this year since we can always go change if we want to. Also this year our friend Kevin from California is flying up here then the following day we will all fly to Atlanta. I think he’s going to have a great time. He’s never gone and he finally said yes, he’d love to go this year. I imagine we’ll actually play games in the game area this year; we talked about it last year but never actually went, and the year before we just walked around watching others play games. Don might even go do the midnight drumming as well since we don’t have to worry about catching the last train of the night back to the hotel. I sincerely hope this is our year our child finds us and would be thrilled! 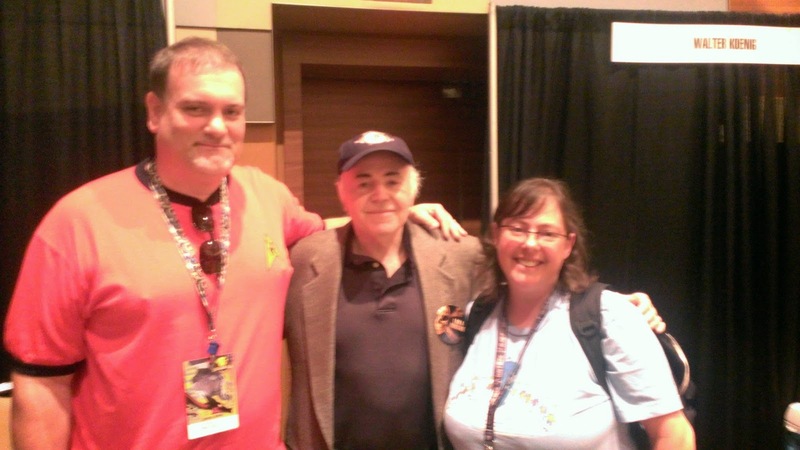 if we got to attend Dragon Con as a family. I had a question come up over the weekend that, while I answered fairly clinically yet truthfully, can be said another way. Life doesn't have any guarantees! It just seems so callous to point that out but it remains the utmost truth. I think we all strive to hold to our arrangements and to our word to friends, family, bosses, co-workers, etc. but sometimes life happens and plans and arrangements must be put on hold or changed. It has happened time and time again in various situations. People get sick or move away or can’t get time off from work. Again it’s life and we have to adjust to those changes to make things work out. Having said all that the question I was asked was “How can you guarantee me you’ll stick to an open or semi-open adoption.” I went the clinical and logical way of answers. Explaining that not only did we sign up specifically for an open adoption because it’s all around better for all involved but that our agency would help us facilitate an agreement outlining what was expected as a minimum from both sides. I went a bit further on the details but I can say they never responded. I obviously didn't fit the bill on answers or they are weighing whether I spoke the truth. I read about a lot of parents who do make agreements and they change, sometimes because the birth mom/parents disappear, others out of safety for the child and unfortunately sometimes because the family just doesn't want contact. I feel the ones who just don’t want contact shouldn't be trying for an open adoption and should be up front with the expectant parents (We don’t want a closed adoption and we’re up front and truthful on what kind of relationship we want after placement, everyone should be). It truly saddens me to hear about those situations, although I think they aren't as common as some people think (Thanks to the internet it seems every other story featured is something like this but it seems propagated by a minority). Most of us hopeful adoptive parents truly want to include birth parents in our extended families. It has been shown that not only does the child grow up more secure and well rounded but it helps the birth families as well to know the child is in a good home and well loved and taken care of. Can things go wrong? – Yes. Are any relationships perfect? –No. Everything takes work, communication and dedication. Parenting is no small, easy or cheap task. It takes great strength and courage to become a birth mom/dad and with that is a great amount of loss. That loss is felt by all of us in the adoption community even if we haven’t become parents yet but we see through the eyes of those who have. I can never know the pain and loss of the birth mom/dad/family and I will never pretend I do but I can empathize with them. I truly believe in the open adoption; can I guarantee you we will fulfill our end of the agreement, yes, just as much as you can guarantee us. Remember Trust is key but even with it life has no guarantees. We can only do the very best we can to maintain our relationships and fulfill our agreements; all the while remembering the child we all share and love. We aren't there yet but here’s to 2015 being our year to have our family!